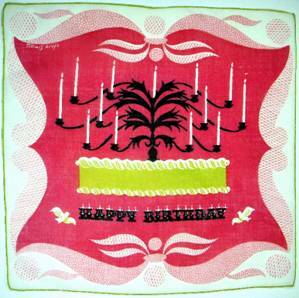 One lovely advantage in gifting a handkerchief – the recipient has a permanent reminder that they’re considered special. Once, when I was addressing an audience about “Leaving A Legacy”, a mother came up to me afterward, and withdrew a letter from her purse. It had obviously been read hundreds of times, as the folds were taped and re-taped multiple times. The letter was from her son, telling her how much he loved her. “I read it almost every day” she told me, her eyes glistening, “more than that, actually, when I’m having a particularly difficult time. I know he is busy, and I don’t want to bother him, but you need to remind young people that they just can’t say I love you enough. That’s all a parent really needs to hear.” I couldn’t have said it better. 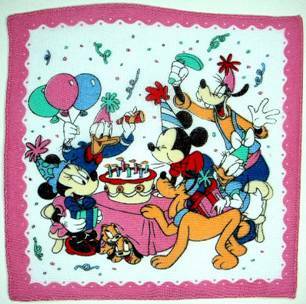 That’s why I love these birthday handkerchiefs. They provide good wishes you can carry with you every day. And they remain fresh and colorful for decades. A little happiness in your pocket. Who could ask for more? 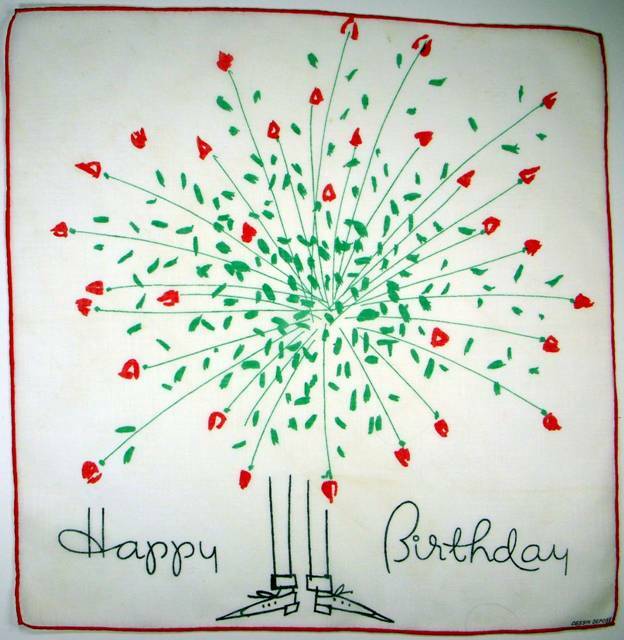 Love this festive hankie. Even the cat chimes in with a melodious meow. “Youth cannot know how age thinks and feels. As we start a new year, a new chapter in our lives, let’s celebrate the passage of time with gratitude that we’re here to turn another page of the calendar, witness another sunrise, take a walk with a loved one, share stories old and new. 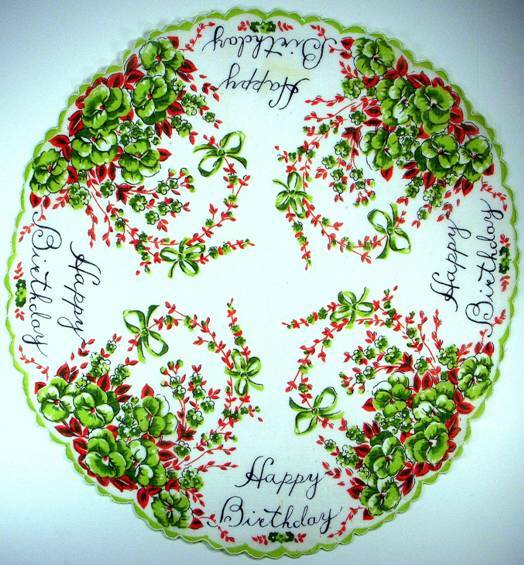 Since each one of us has a special day to celebrate at some point this year, it’s time to send good wishes to one and all, regardless of when your special day arrives. 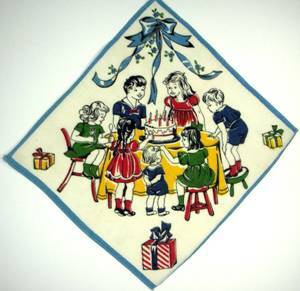 These children’s hankies hearken back to a simpler time when a party meant sharing cake and ice cream with friends, instead of the blow-out extravaganzas we sometimes see today à la The Real Housewives. 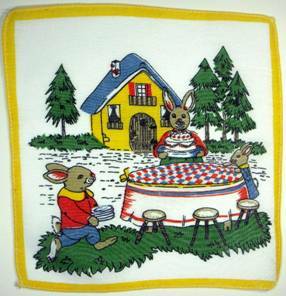 When entertainment consisted of pin-the-tail-on-the-donkey, or perhaps watching a Disney cartoon. 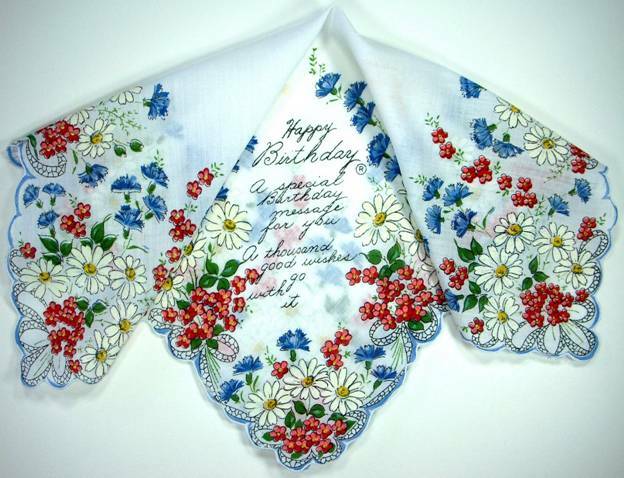 A handkerchief was a keepsake, and often lovingly embroidered, as it would be cherished for years to come. I’m crazy about this sweet pup with his appliqued jacket. 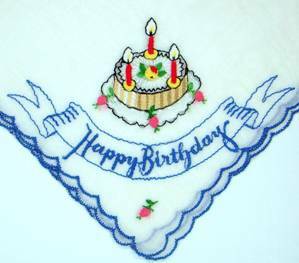 That extra button flying behind reconfirms he’s stepping lively to deliver the cake before the candles melt. 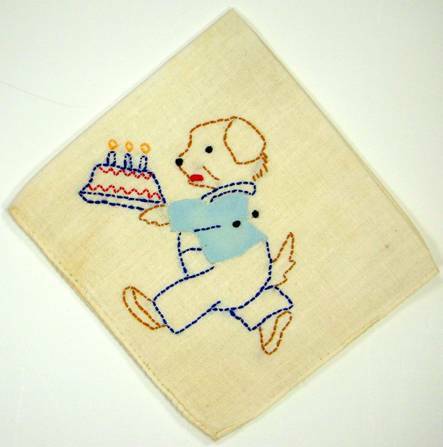 Embrodered on heavy linen, It’s possibly from the 1930s. 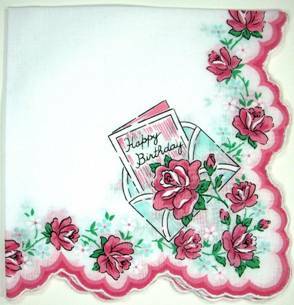 A cake, roses and hand crocheted border, alongside a garland of hand embroidered flowers. 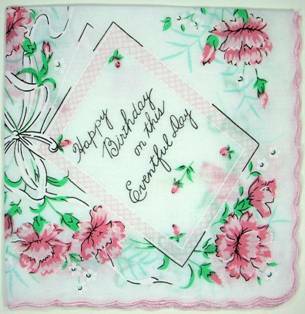 Time and care went into this pair of greetings. Another charming pair. 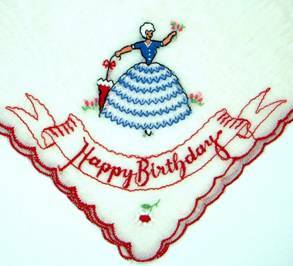 Look at the embroidered detail in her dress and on the tiny cake. 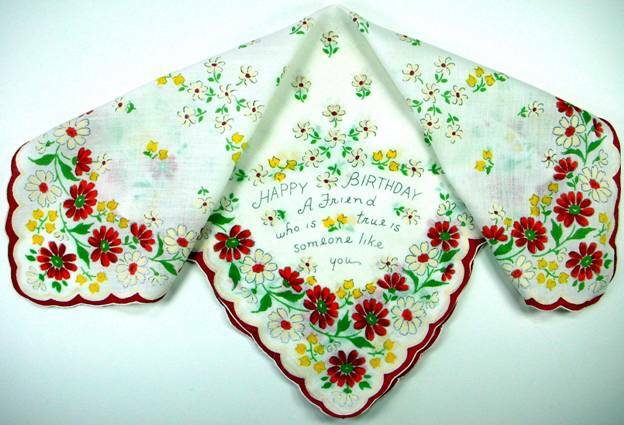 Less expensive, but equally as charming, and more durable, were the printed handkerchiefs, with message of enduring friendship and lasting good will. A spouse might receive something a bit more romantic. 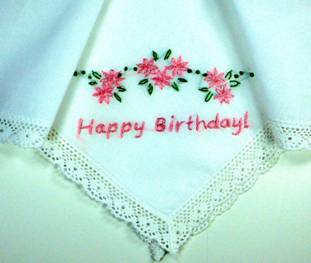 While a daughter might receive a fun and flouncy scalloped edge circular hankie. 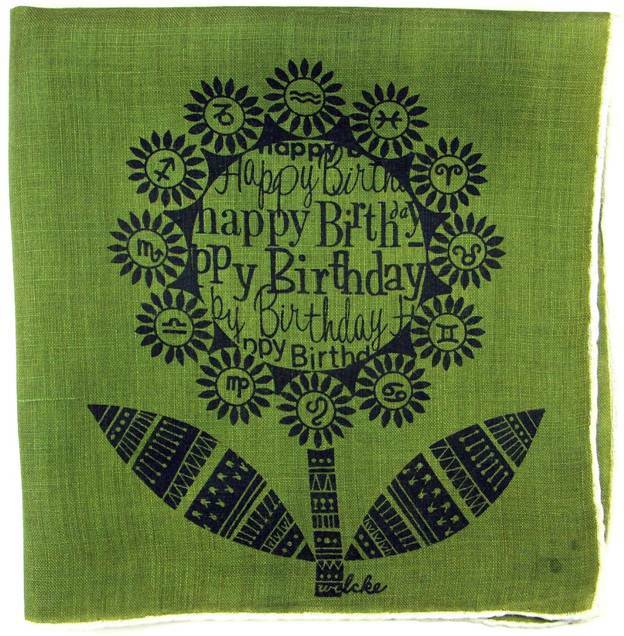 This hankie from the 1960’s-70’s is Mad Men hip and cool, with sunflower petals depicting the signs of the zodiac against an avocado green linen background. 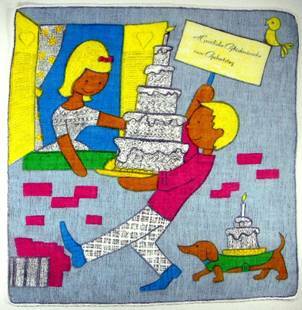 Once again artist Ritva Coffron delights us with her fanciful characters – the calm, cool, collected swain with a bountiful bouquet, contrasted against the eager-to-please boyfriend who even baked a cake for his dog to carry. Note the greeting is in German, thus a dachshund conveys the treats. 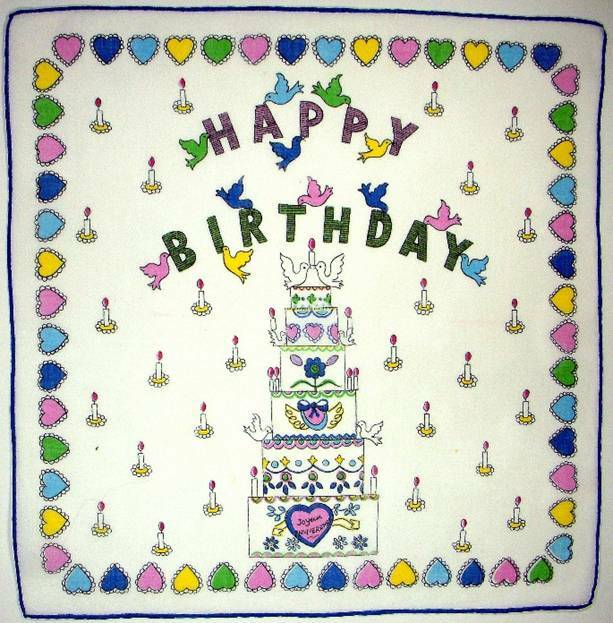 Here’s another muli-tierd wonder that celebrates with hearts, lovebirds and a sky full of candles. 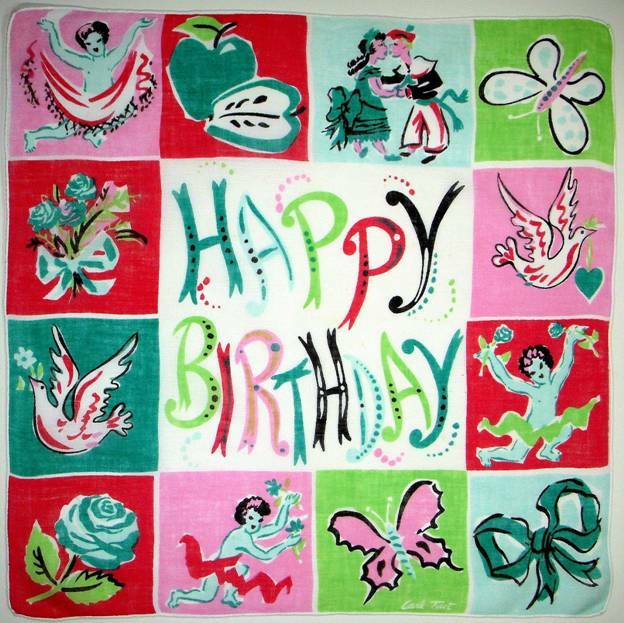 The simple style reminds me of the innocent children in the Joan Walsh Anglund books. The artist encored with a floral flip and a twist. 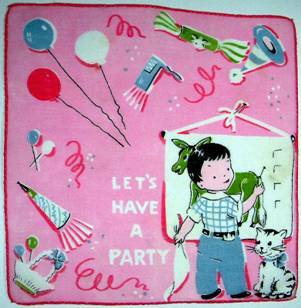 Let’s party hearty with a piñata shower of candy and presents. 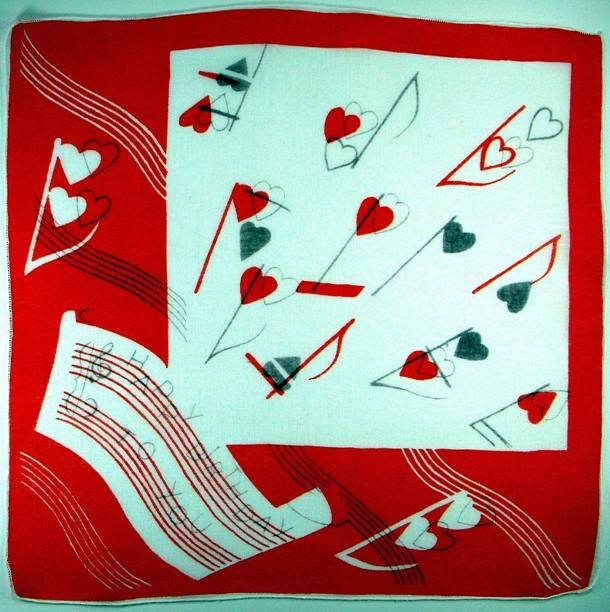 The border is both scalloped and shaped, and will present a lighthearted and fun appearance when folded and tucked in m’lady’s breast pocket. A sophisticated charmer that’s literally full of “love” notes. Surprise party indeed! The champagne cork won’t be the only thing flying sky high! Love the leader’s plumed hat, sword and curlique tail. Printed on a striped cotton blend, it’s simply sublime. 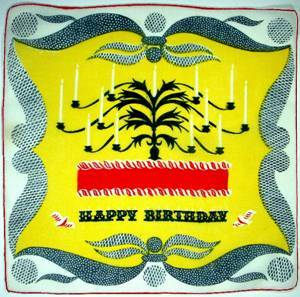 Few can do fetes better than Tammis Keefe, so we’ll give her free rein in the next few hankies. These celebratory wonders are pure jubilation. How she manages to perfectly combine frivolity with sophistication is a mystery, but she does it to perfection. The cake itself provides a space for you to add the recipient’s name, and who needs candles when a candelabra is much more fun! 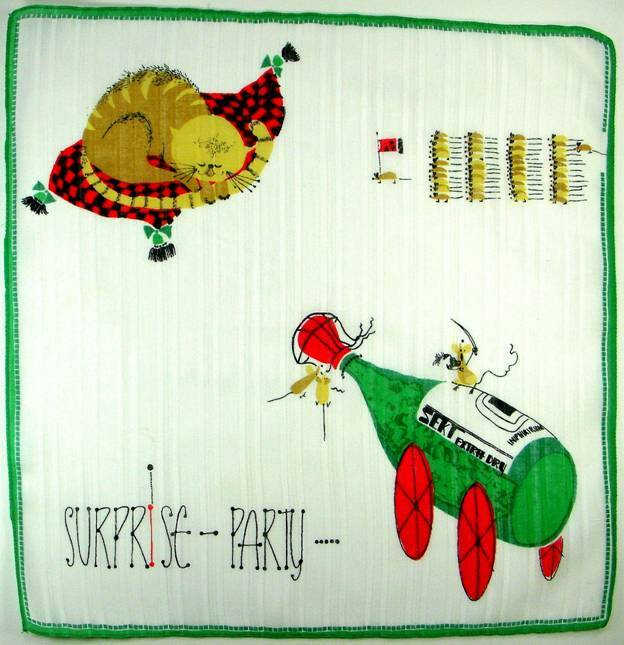 This hankie would be perfect for a granny with the pizzaz and polish of an Auntie Mame. 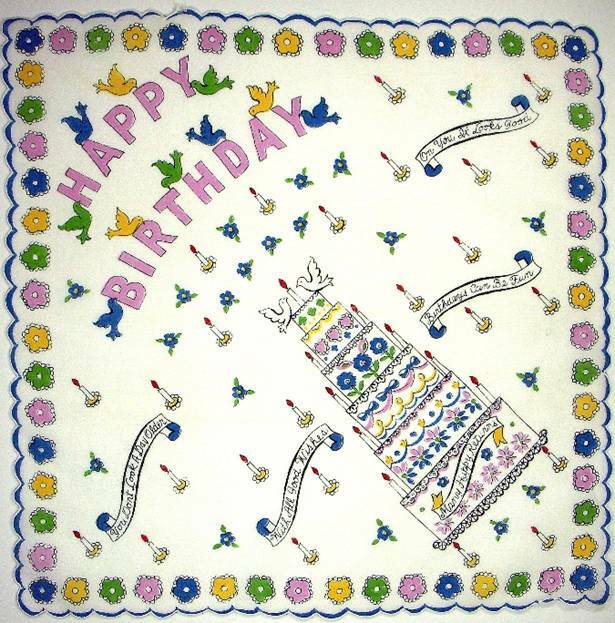 Who needs a cake, when your poodles can sport a crown of candles? 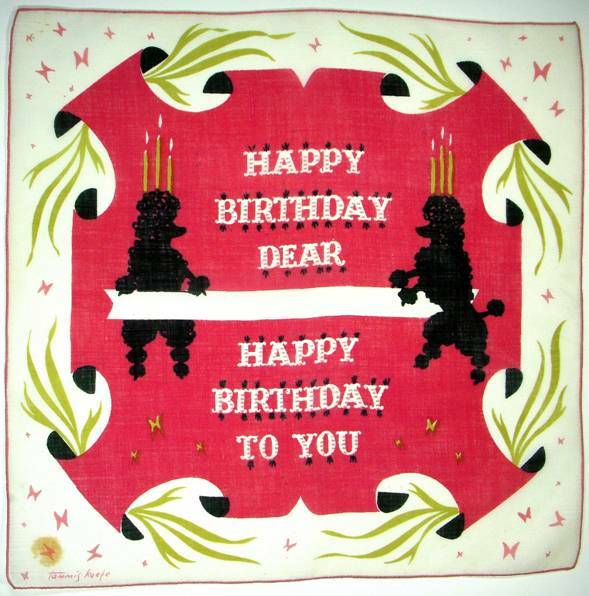 Once again, a banner is provided for the recipient’s name. It’s charming and festive. 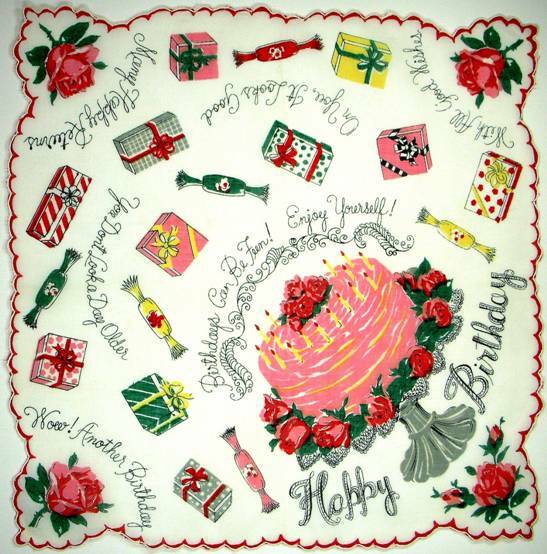 Roses and lovebirds, butterflies and bows… what lady wouldn’t love to receive this from her beloved on her special day? 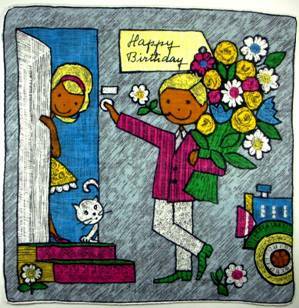 The border images on this hankie almost seem to depict a newlywed couple who just bought their first home, nevertheless it’s a birthday greeting. 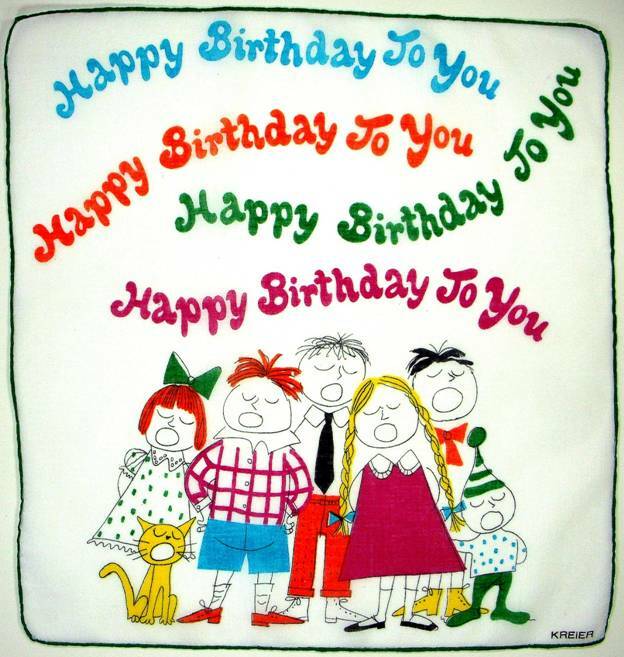 Perhaps on your birthday, you’re just happy to celebrate everything. “You have to find what’s good and true and beautiful in your life as it is now. 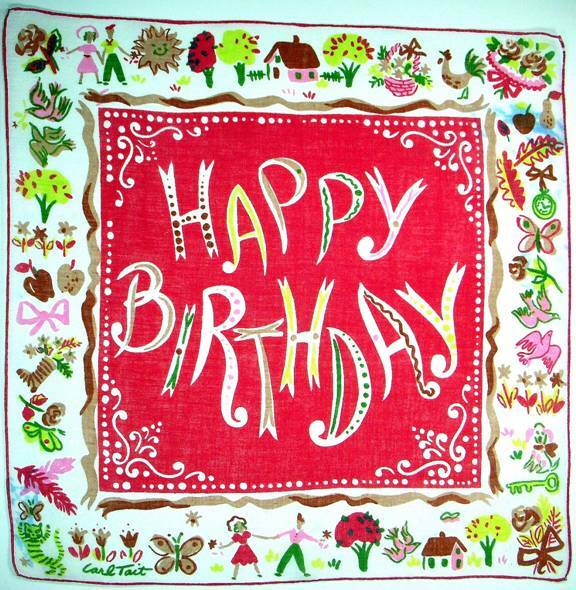 Happy Birthday was great. 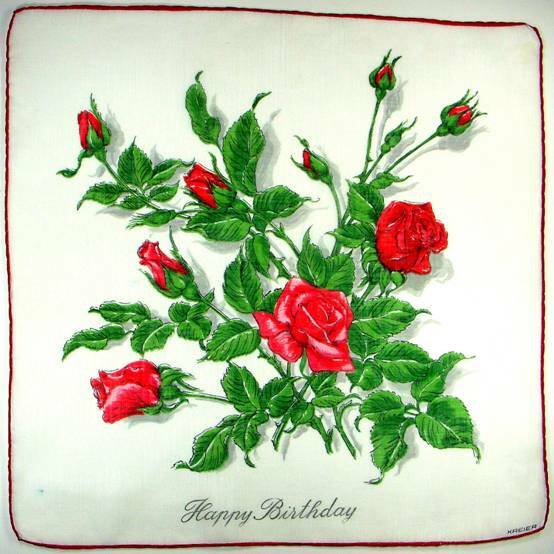 Thanks so much for all of the interesting hankies. Who knew??? Your newsletter is such a delight! Dreidels were fascinating. Thanks you so much. For non-subscribers (you don’t know what you’re missing…)I’ll explain Ellen’s comment. 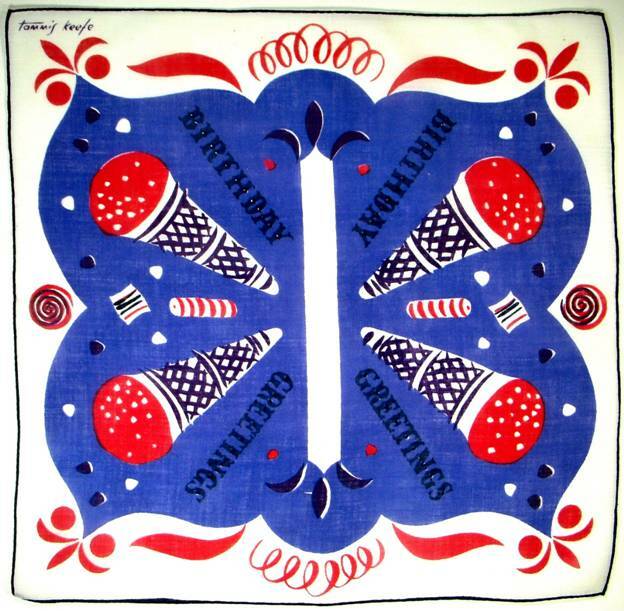 The Accidental Collector/Handkerchief Heroes website contains two completely separate blogs. Both are found on the home page. Under the heading “The Accidental Collector”, you never know what you’ll find; it’s always a surprise. 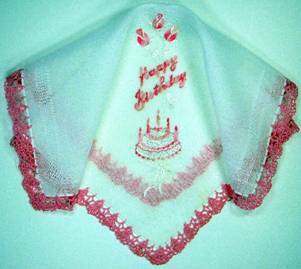 The second, and main blog features history as told through handkerchiefs, and is found under the heading “Blog.” Enjoy!